Prevue Pet Products Wrought Iron Flight bird cage with Stand White Hammertone bird cage makes the perfect home for multiple parakeets, canaries or finches. 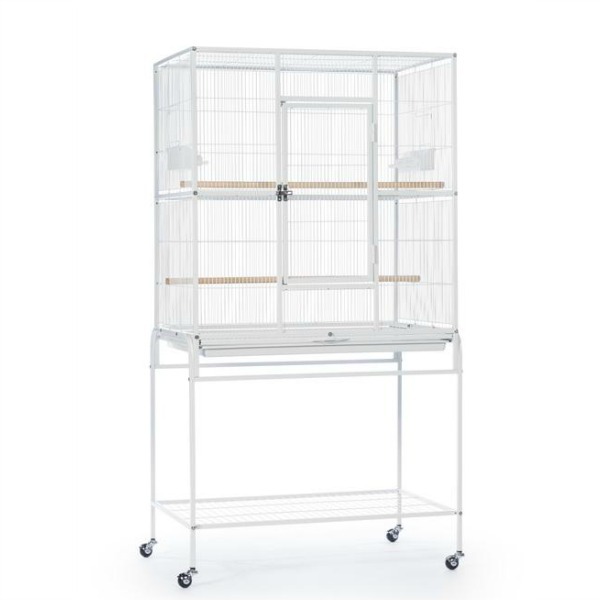 Featuring one large front door and a bottom shelf for additional storage space, this flight bird cage stands on rolling casters and is easily moved from room to room. Two plastic double cups and two wood perches are included in this economical large bird cage. I love this cage! It's sturdy, easy to clean, and best of all, my 14 parakeets have a great time in it! This cage is well-made, all the pieces fit together beautifully and there are no irregularities that could cut a curious bird's tongue or toes. There's room for a variety of swings, perches and toys. It's by far the best cage I've ever purchased.